We’ve been blessed to live here onsite at Camp Vick since 2002… 15 years now. There are many things that I know seemingly inside-out.There are many things that strike me anew… and that is a beautiful thing. Micah started school in 2005 and since that point I’ve seen this view several times a day for the last 12 years as I wait for the bus. A few years ago God used these big trees and their pine cones to speak to me. In spring, in summer , through the fall and in the winter these evergreens stay, well, ever green. And while they don’t bear fruit or dazzle me with leaves of color, they are not dormant. So when, one spring day, I chose to look I was amazed by how many teeny, tiny pine cones were growing from top to bottom of the enormous trees. So I showed the kids, who seemed to care only a little more than less. And time went on. Seasons changed, summer passed, the weather cooled and back down the driveway for bus duty I resumed my multiplicity of trips. And I saw them again. Winter came; sn ow blanketed the landscape and I went to take pictures of the beauty and there I saw them. ‘Cause see, I didn’t know, that wasn’t their timetable. They weren’t born by a deciduous tree, they were on an evergreen; and as such, their timing takes longer, years in fact. So the pine cones grew on. If I judged the productivity of the pine cone against the growing season of the fruit of a leafy tree, I’d likely conclude they had missed their chance or something was wrong. While the purpose is similar, God’s design and timetable for a pine cone and an apple are not the same. We can learn a lot about ourselves from the difference. I’ve been doing a Lent Photo-A-Day Challenge on Instagram. Quite a challenge indeed as each day I focus on a new word and look to scripture as God speaks to me (and I’ve had fun taking pictures too). Yesterday’s word was: wilderness. And I remembered this photo from that September 2014 post. 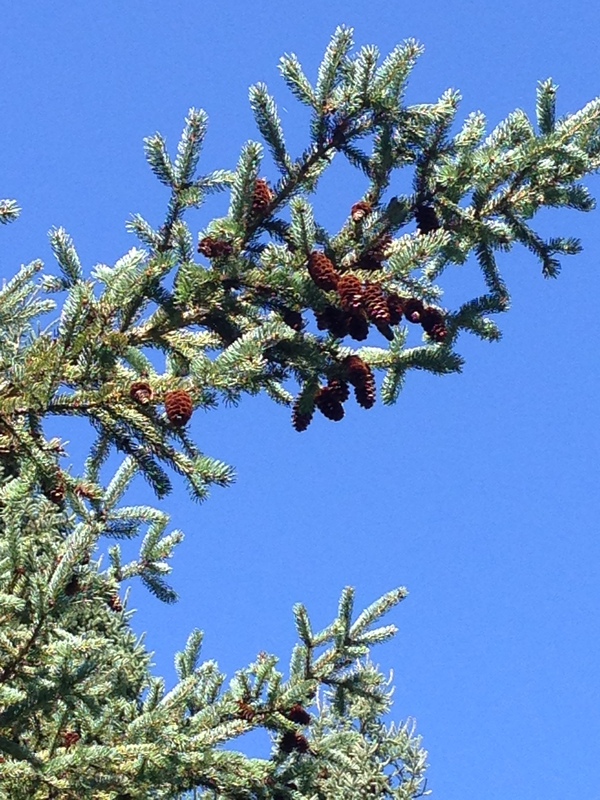 See, the story of those trees, the pine cones and me… it isn’t done yet. A few months ago, standing at the end of camp road I took notice of those huge pine trees. But something was different. Do you see it? The trees are empty. The pinecones have fallen; their time has come. I’ve been watching these pinecones since August of 2013 when I first noticed the new growth covering the trees. See how cute those newly growing pinecones look?! (It’s okay if you don’t think so. I get it. My family thinks I am a liiiiittttllle weird for paying so much attention random things.) Three years of weathering season after season and now (my) little pine cones had fallen. Their time had (finally) come! I remembered the words I’d written about pine cones, timing, and purpose. Oh how much we need to hear them; what’s more we need to heed them! Friends: You have purpose. You have value. You have worth. The purpose for which our loving Father has specially made you may not look like anyone else but the beauty of an apple doesn’t make a pine cone ugly. Your value isn’t lessened because your purpose may be more subtle. 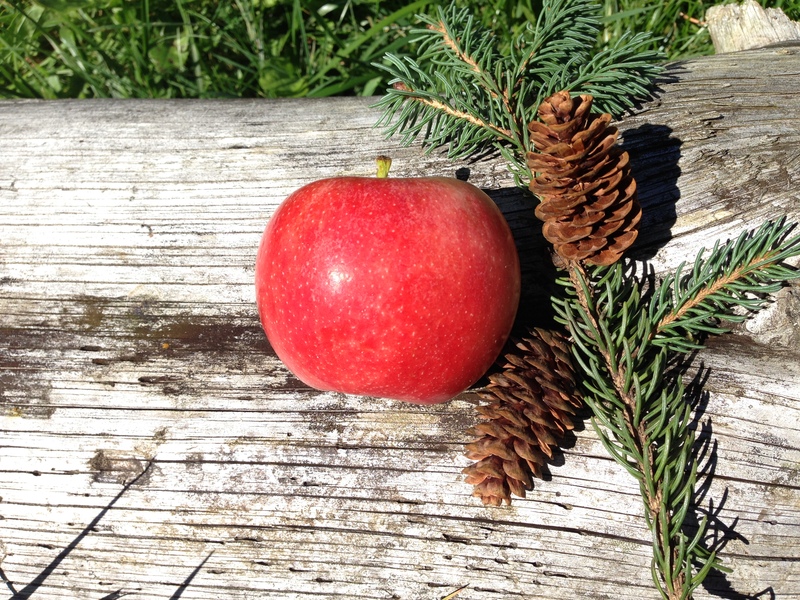 An apple ripens in one growing season while a pine cone may take years but that doesn’t make it slow or behind the curve. Your spiritual maturity isn’t lessened because your time has not yet come. When a pine cone becomes squirrel food instead of a seed bearer, that doesn’t mean the pine cone failed but that its purpose was different. Our loving Father knows when and how best you were meant to be the utilized for His glory. There was one last photo I put in that post. And man, that last photo though. It has stuck with me. Falling from the tree wasn’t the fulfillment of the journey for those pinecones nor was it the end but, instead, the journey continues. There are days that picture gives me hope. There are days that picture speaks volumes of my struggle. Hope in God’s timing and purpose for me. Struggle in that God’s timing and purpose can look very different from what I’m expecting. Walk around camp and you can find pine cones of many kinds in many stages. Some on trees. Many fallen. Some shredded right to bits. Only a small few have grown new trees. Good gracious… how often do I feel like a pine cone? Brittle, fallen, scattered on the ground… but that pine cone isn’t as destitute as it looks. And neither are we. I love and struggle with Romans 8:28, “And we know that in all things God works for the good of those who love him, who have been called according to his purpose.” Sometimes that looks an awful lot like the wilderness. And sometimes the wilderness is right where we need to be. Scripture shows us that over and over. Trusting God in those wilderness moments is where faith is needed, stretched, grown. Hebrews 11:1 says, “Now faith is confidence in what we hope for and assurance about what we do not see.” Faith is how we hope in the wilderness. Faith is how we endure the wastelands. In the wilderness faith is stretched. In the wastelands faith is grown. God meet us right in the wilderness, sustain us through the wasteland. Help us hope in you alone. Give us faith in your never-failing promises. Amen.